Whisk 1 cup flour, onion and garlic powders, paprika, cayenne, salt and pepper together in a medium bowl. Set aside. In a separate bowl, whisk together the egg and water. Heat the butter and oil in the skillet till sizzling. Dredge the steak in the flour mixture, then the egg and then back in the flour mixture to coat. Add the steak to the skillet. Repeat with the remaining steaks adding more oil as needed. Work in batches if necessary as to not overcrowd the pan. Overcrowding will cause the steaks to steam and the coating will not get crisp. Cook the stakes for 3 to 4 minutes or until crisp and golden brown. Flip the steaks and continue cooking for an additional 4 minutes until golden. Transfer the steaks to a platter or baking sheet and cover with foil to keep warm. Add butter to the same skillet and sprinkle with flour. Whisk together in the pan and cook until golden. Slowly whisk in the chicken stock and continue cooking until thickened. Stir in the cream until smooth and beginning to thicken. Serve the steaks immediately with the gravy. A few years ago I came across the recipe for Chicken Fried Steak and I made it. I came across the video again lately and it looked soooo nice I decided to make it again. If anyone is as curious as me as too why it’s called ‘chicken’ fried ‘steak’ (well I googled its origin and here’s a brief synopsis of it “Chicken fried steak is an American breaded cutlet dish consisting of a piece of beefsteak. 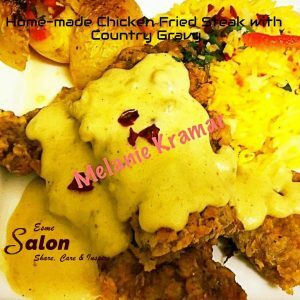 Where and when the term “chicken-fried steak” began remains a mystery. The precise origins of the dish are unclear, but many sources attribute its development to German and Austrian immigrants to Texas in the 19th century. Anyway, after that Bayan 😊, moving on … Now whilst I’ve never followed a recipe verbatim in my life, this pretty much (95%) sums up what a “Chicken-Fried” Steak is all about (BTW it came out fantastic – especially the sauce). Served with potato wedges and slap-dash egg fried rice. We have lots and lots of chicken recipes, so feel free to browse and enjoy! That looks amazing! I think this type of food gets a bad rap because of gravy and breading, of course, but anything you make at home can be tailored to be healthier – home cooking always! Thanks John, yes anything you make at home you can make to your own preference and liking. Hope you enjoy it and I am looking forward to your next Guest post.